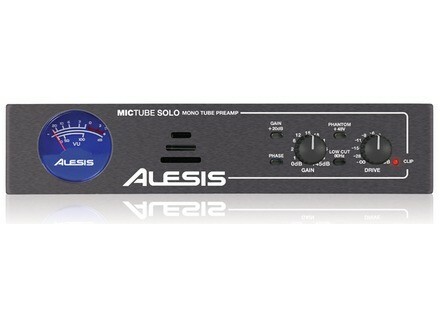 MicTube Solo, Tube Pre-amp from Alesis. Alesis introduces MicTube Solo and MicTube Duo microphone preamplifiers at the Frankfurt Musikmesse show, Hall 5.1 Stand #B45, from April 6-9 in Frankfurt, Germany. The MicTube Solo and MicTube Duo are single- and dual channel tube preamplifiers respectively, designed to add "warm, vintage tone" to microphones and instruments. The MicTube preamplifiers feature control layouts and vintage tone, courtesy of the 12AX7 vacuum tube. Aside from the tube, each model features a minimized circuit path. The MicTube Solo and Duo amplify the input signal of condenser or dynamic microphones to line level. Recording artists and engineers will find a -20 dB pad switch for mics with hotter outputs or louder sound sources. Phase reverse switches are designed to help optimize multi-mic setups, and 80 Hz high-pass filters should help cut bass, handling and wind noise. Both preamps provide +48 volt phantom power for condenser microphones. In addition to standard three-pin XLR jacks for microphones, the MicTube Solo and Duo offer 1/4-inch, high-impedance DI (direct injection) jacks for plugging in guitars, keyboards and basses. Separate Gain and Drive (“vintage”) controls allow users to dial in a blend of level and tone. Professional XLR and 1/4-inch outputs are featured. MicTube Solo and MicTube Duo preamplifiers will be available from musical instrument and pro audio retailers Q3 2011. [Musikmesse] SPL NEOS SPL releases a new mixer and/or summing box, NEOS. [Musikmesse] Alesis 3632 Compressor Alesis announces the 3632 Compressor, a dual-channel compressor, limiter, and gate unit. [Musikmesse] Alesis Nanoverb 2 Alesis announces the NanoVerb 2, a digital effects processor for musicians, sound engineers, recording artists and more.